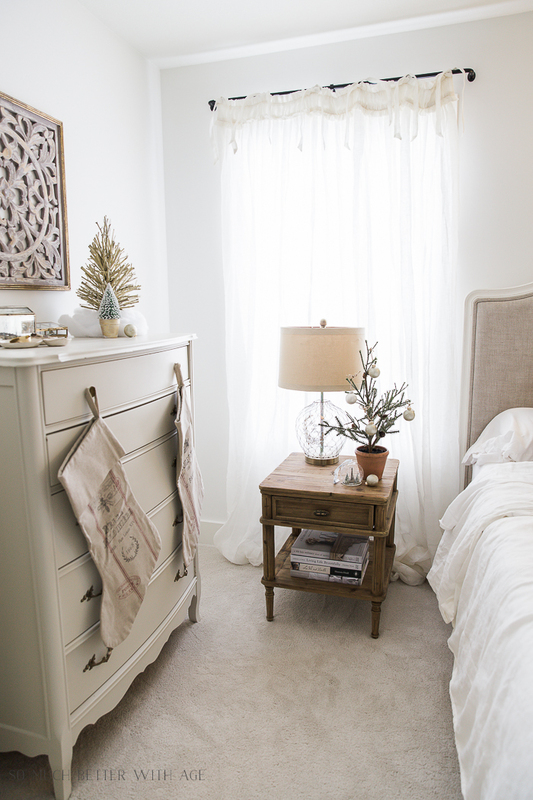 A tour of my French master bedroom decorated for Christmas with simple yet beautiful evergreen and ornaments. 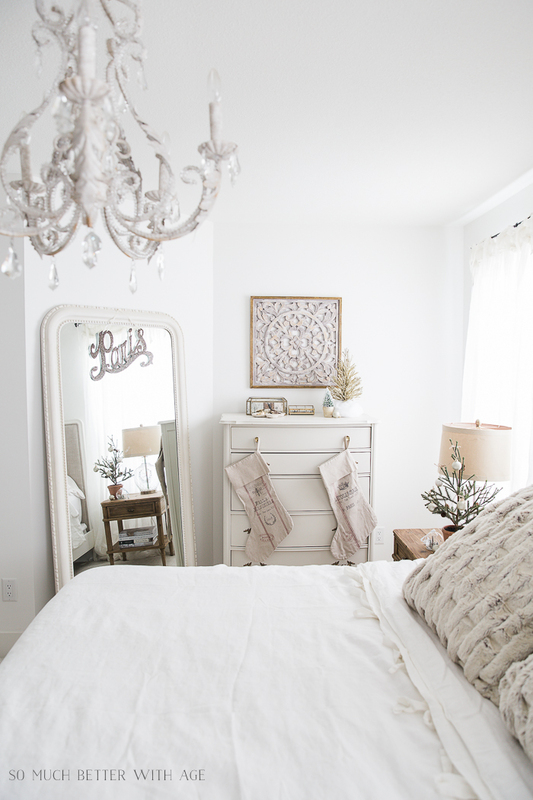 I’ve made a few updates to my master bedroom recently and decorated it for Christmas so I thought it was the perfect room to share with you for this tour. 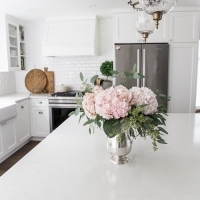 Today I’m participating in the Canadian Bloggers Home Tour hosted by Shannon of AKA Design and Christina of The DIY Mommy so be sure to check the rest of the tours at the end of this post. If you’ve been a long time reader to my blog, then you might remember this armoire of mine. I haven’t had it up since the old house. You can read all about the makeover here. Wreaths hanging on the mirrors with green organza ribbon make the perfect Christmas scene. On the other side, I have the dresser I painted last year and a mirror from Restoration Hardware. The chandelier is from RH too. I love this beautiful wooden art piece. It goes perfectly in this room. The crown above our bed I recently found at an antique store and wrapped twinkly lights around it. I love a creamy-white bedroom with natural wood. Simple decorations like the wreaths, a few items on the nightstands is all that is needed for some Christmas decor. 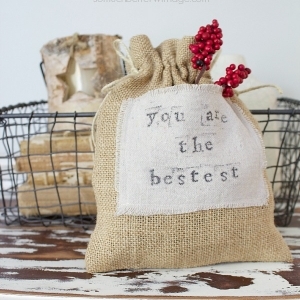 The faux fur shams are a perfect winter addition. Thanks for joining me on this tour today. Don’t forget to tour my Canadian friends’ beautiful homes. Visit my Christmas living room tour. Visit my Christmas dining room tour. So simple and pretty! 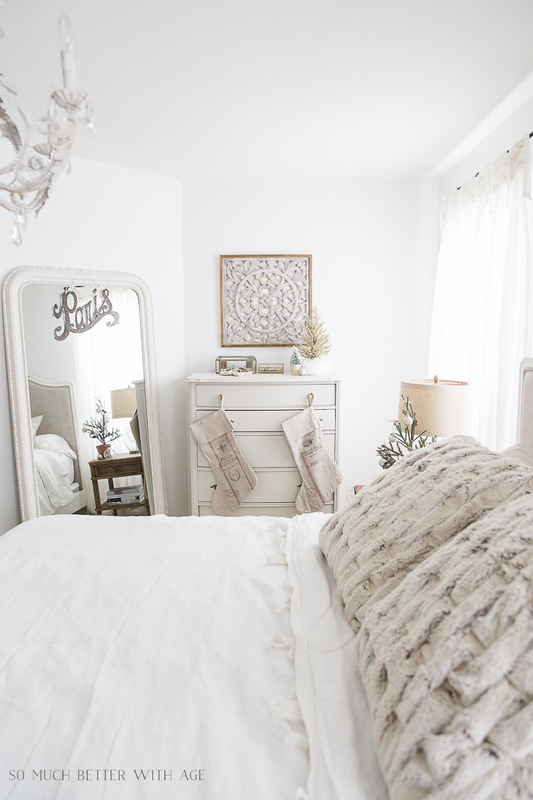 I love the two wreaths on the armoire! 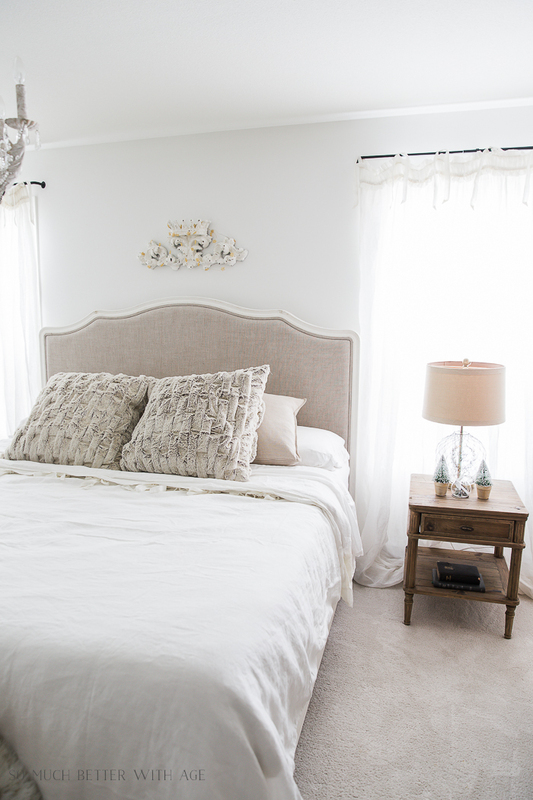 Oh my stars, Jamie your master bedroom is so peaceful – sigh. 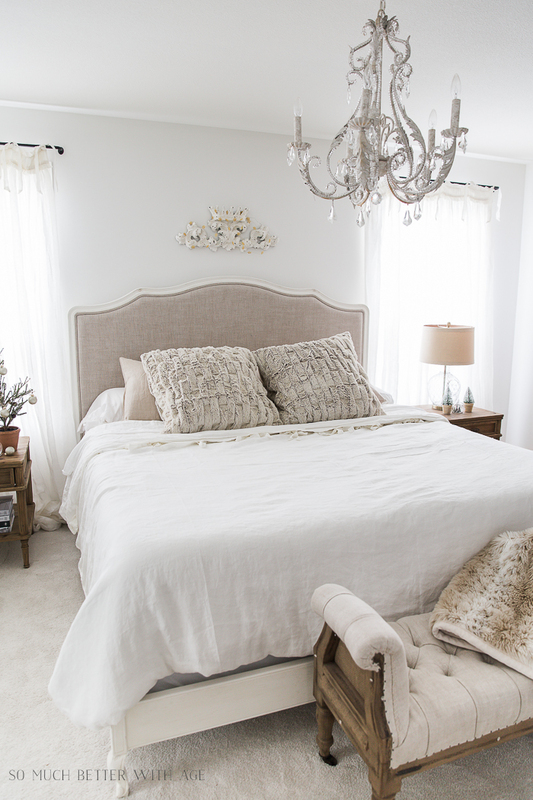 Those faux fur pillow shams are the perfect cozy touch to your beautiful bed, I bet they are just so soft! And that armoire, swoon! Perfectly refinished a real labour of love! xo I’ve been wondering what to use on my newly acquired pantry door and I think it’s white wax, thank you for that tip! Thanks Laurie! 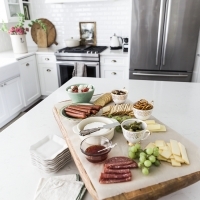 Yes, love the white wax on the natural wood. Such a clean and fresh take on the season. I love all my colours, but your home has such a soothing effect. I would love to spend an evening there and take in all the details. Happy holidays! Thanks Shauna! I know, he did an awesome job! So very beautiful Jamie!! Have a Very Merry Weekend! Thank you Shirley! Happy holidays! That armoire is beautiful, stunning room! I love your armoire. It has great detail. I’d love a bed like yours for my guest bedroom. I love the curved top minus the button tufting you usually see. If you find a close option, I’d love to know. You have just right amount of Christmas in your bedroom. Beautiful! Elegant to the max! Is that wooden art piece a piece of shisum (speling?) wood. They come from India. It looks like the type of carving and it’s been white wash over the finish. It might be! 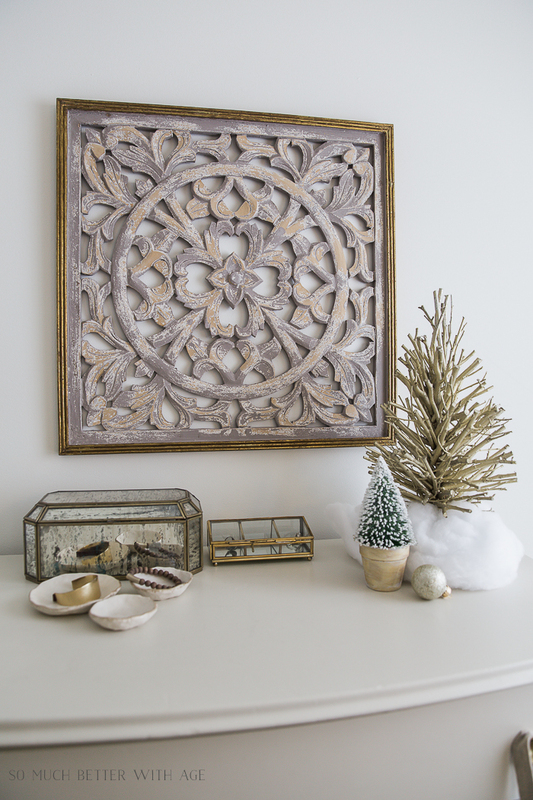 It’s from Soft Surroundings and is wood with gold and a white wash over it. It’s gorgeous, isn’t it? haha, no trees in this room! Thanks Pat! Looks like a bedroom i could snuggle into.lovely. Thanks and have a very Merry Christmas. So calm and beautiful and classic, Jamie! Gorgeous tour!! Merry Christmas, friend! You have such a lovely bedroom Jamie! 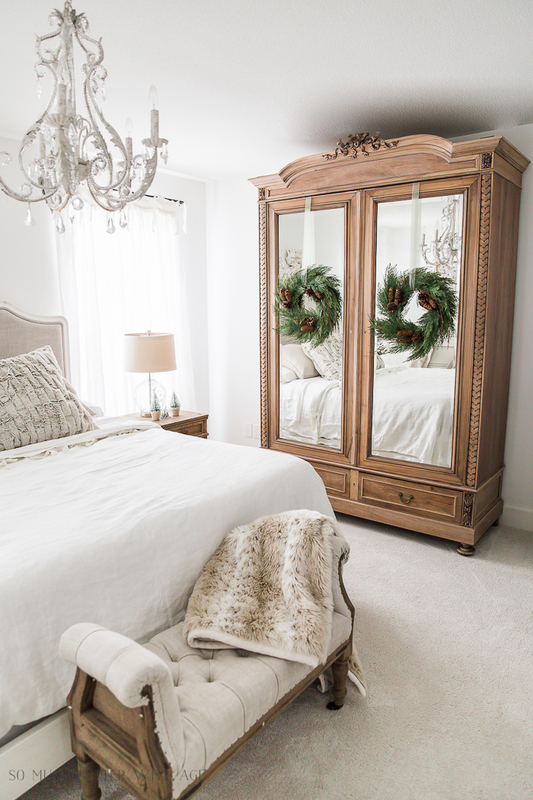 Everything looks so cheery and bright for Christmas…I especially love the wreaths hanging on your armoire! Happy holidays to you! Jamie, your bedroom looks amazing -so cozy and warm. It’s like the perfect little Christmas B and B, but at home. Great job! 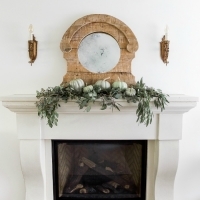 I love the festive touches with the crisp white decor – beautiful! Jamie, your bedroom looks so serene and lovely! I love, love, love your armoire and how wonderful that your boyfriend did all that sanding! (I don’t think I have the patience.) The wreaths look so festive and pretty. Hope you get some time to enjoy your little sanctuary. I’m so glad he did it and not me too! So much work. Thanks so much Joann.